Originally scheduled as an MGT tour featuring Wolfgang, Slava and U.S.A. legend Ralph Towner, Leonard’s last-minute inclusion is a result of Mr Towner falling ill – while he cannot make the tour, the good news is he is recovering well. Audiences can look forward to hearing existing compositions by Towner, Muthspiel and Grigoryan along with new works composed especially for this tour. Wolfgang Muthspiel is one of the most revered guitarists on the world stage. Soon after graduating from the Berklee College of Music in Boston he joined the Gary Burton Quintet, the first guitarist to do so after Pat Metheny. A prolific collaborator, Muthspiel has recorded and toured with the likes of Trilok Gurtu, Dhafer Youssef, Brian Blade, Rebecca Bakken, Youssou N’Dour, Maria Joao, Dave Liebmann, Paul Motian, Gary Peacock and many others. Since 2014 Muthspiel has released three albums as a bandleader on the iconic German label ECM. These projects have seen him in the studio and on tour with jazz luminaries including Brad Mehldau, Brian Blade, Larry Grenadier, Ambrose Akinmusire and Eric Harland. Among his numerous awards are the Hans Koller prize for ‘Musician of the Year’ and ‘European Jazz Musician of the Year’. The Musicians Magazine elected him among the ‘top 10 guitarists in the world’. 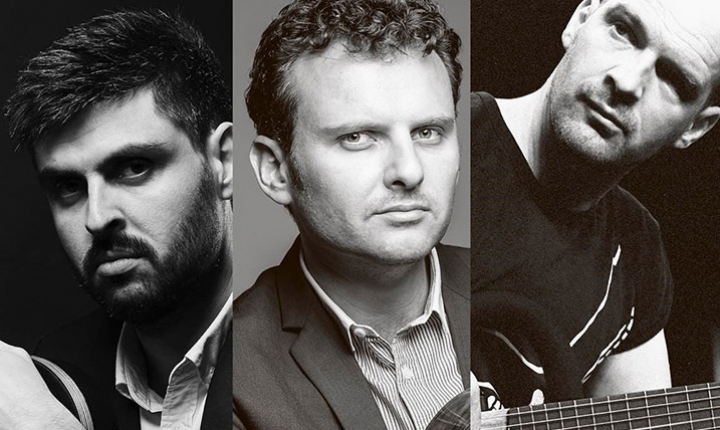 Bringing diverse influences, stunning technique and risk-taking improvisations – performed on an array of guitars including classical, baritone, 12-string and electric guitar – the Grigoryan Brothers with Wolfgang Muthspiel promises to be a unique musical experience.